Inzinc Training Solutions provides 5S training in Bangalore, Mumbai, Hyderabad, Pune, Chennai, Delhi and other cities in India to enable Businesses realize the benefits of proper Workplace Organization. What is 5S System? What are the benefits of 5S System? The 5S System is a Workplace organization system that is intendedtowards organizing a work place for efficiency. Products / materials / other items required for operation are available when needed in quick time. The unnecessary waste is removed from workplace. Workplace remains clean and neat. Who must attend the 5S Training Course? What are the benefits of 5S ? What is 1S, 2S, 3S, 4S and 5S ? At the end of the 5S training course, an Examination is conducted and test papers are evaluated as per the Criteria. Accordingly, certificates will be issued to individuals who pass the test as per the test criteria. Experienced personnel who have implemented and trained in the 5S System. 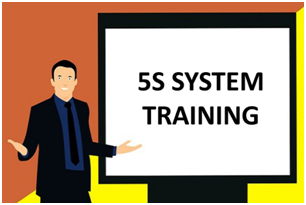 We provide 5S System training in Bangalore (Bengaluru), Bagalkot, Belgaum (Belagavi), Bellary, Bidar, Bijapur, Chamarajanagar, Chikmagalur, Chitradurga, Coorg, Dakshina Kannada, Davanagere, Dharwad, Gadag, Gulbarga, Hassan, Haveri, Honnavar, Hospet, Hubli (Hubballi), Kolar, Koppal, Mandya, Mangalore (Mangaluru), Manipal, Mysore, Nanjangud, Raichur, Ramanagaram, Ranibennur (Ranebennuru), Shimoga (Shivamogga), Tiptur, Tumkur, Udupi, Uttara Kannada, Yadgir, and other cities in Karnataka.